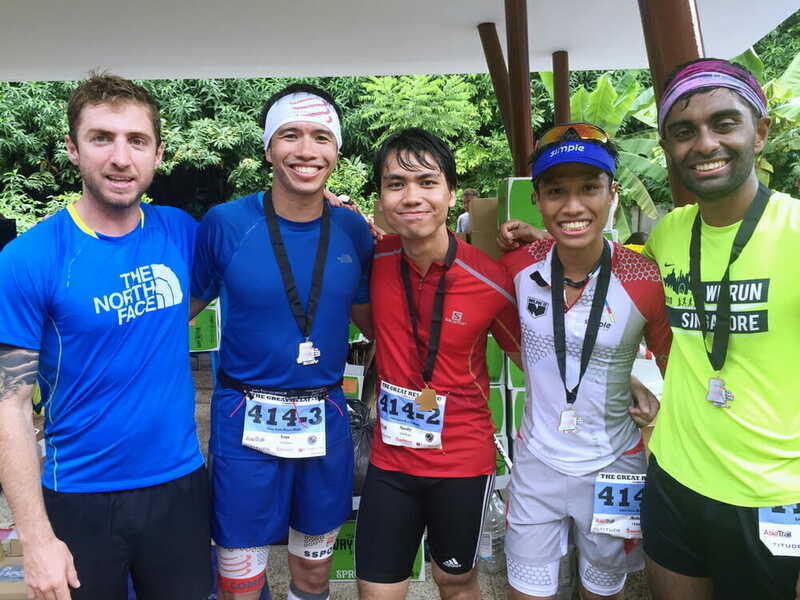 3 months has passed since Vlad Ixel came down to Singapore to promote the Great Relay Race by hosting some trail-running workshops and seminars. After what seems like a long time, race day finally came on a dark and damp Saturday morning at Dairy Farm Road. Andy and myself, took a taxi from Jurong to the race venue at Dairy Farm Road, almost missing the place as it was our first time there as well. After wandering around in the darkness to look for the bib collection table, we found Bucky who had just collected it for us. Ian would join us awhile later. After pinning down our bibs, we were told to move our belongings to the empty car park nearby, as the collection area was to be used as the transition area during the race. While registrations wrapped up and the rest of the teams continue setting up their tents and ground sheets, an announcement was made requesting all the teams first runners to make their way to the starting line for the briefing. The first runner was to begin the race from this point only the first loop while subsequent loops would start from the transition area. 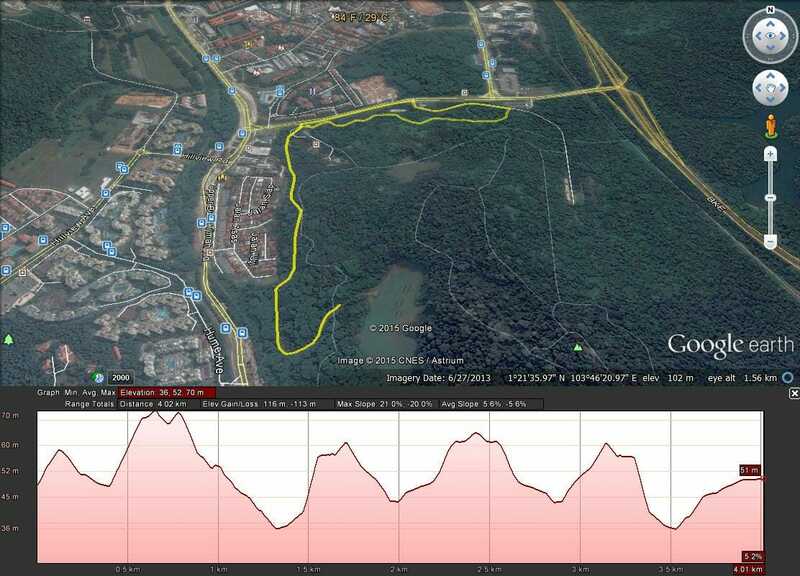 The entirety of the race consisted of a 4 km loop, starting from Dairy Farm Road to the edge of the entrance of Singapore Quarry before making a u-turn to back the transition area. The course consisted of short but steep up-hills on the trails before smoothing out onto a tarmac road. Make no mistake though, the tarmac roads were quite hilly. Runners coming into the transition area must high-five the next runner in the team before the latter can continue on with the next loop. The race official would then scan the runners tag for the currently completed lap time. Here’s a quick video illustrating the transition. Most of the teams experienced a rather ‘rough’ first transition. As the first team runner, I was trying hard to find my team-mate in the rather chaotic transition area. In spite of the mild hiccup, everyone was cheering on for runners who were entering and leaving the transition area. With an estimated time of about 20 minutes per lap (give or take depending on weather and fatigue level), each runner took turns to rest while preparing for the next loop. During the waiting time, I went ahead to check out the sponsors booth. There, I met a team representing a company called Runivore. They were based in Taiwan and had been invited by Vlad to compete in the race as well as promote their products at the race carnival. It was also their first time in Singapore. At the race carnival, they were handing out small cups of Chia seeds mixed with honey and ice which were quite refreshing during a long event such as this relay race. As the race continued on into the afternoon, the weather went from bright and hot to dark and cloudy. A downpour soon ensued causing most of the runners to seek shelter at the race tents. I took over from Bucky to start our teams 6th lap in the pouring rain. As my team mates ran their last loops, the rain soon dissipated, inadvertently signaling the start of my teams 25th and last lap. This lap could be run by any member of the team, in which case it had to be me. 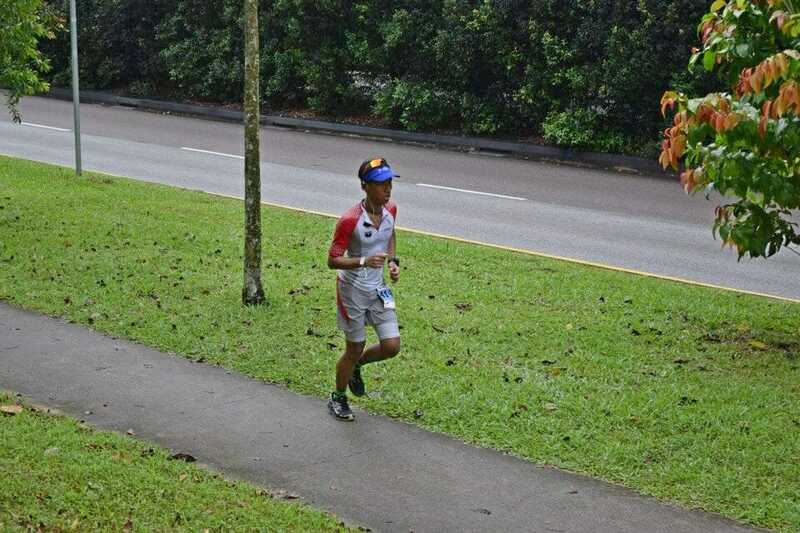 I finished the loop accompanied by my team mates who waited for me to arrive just outside the race venue. Together we crossed the hypothetical finish line to the applause from teams who were still there. The team with Vlad Ixel. In short, this event turned out to be much more enjoyable than expected. As trail runners we have been accustomed to the solitude of the long run, both in training, racing as well as the occasional conversation or two at either an aid station or at the finish line. But this race gave everyone a chance to interact with each other. Be it a friend that you met from a previous race and haven’t’ seen in a long time, an elite runner you’ve been yearning to meet or simply road runners giving trail running a try for the first time. There’s a place for everyone in the race and all are welcome. Thanks once again to Vlad and Eti for putting together a great race. And also a big thank you to all the photographers who devoted their time and effort to come down and photograph the runners.